For those who are wondering, Prince St. Pizza actually took over the spot of Ray’s Pizza, which was considered the original Ray’s. While it’s sad to see Ray’s go, rest assured that a great pizza shop serving just as delicious slices of pizzas has taken over in its place. The interior of Prince St. Pizza was tiny and cozy with brick walls covered in photographs of famous guests and celebrities that have stopped by to eat in the past. Inside the small and open dining area were a few round high top tables with bar stools. Lining the walls on each side was a counter with space for a few more guests to eat. You could tell immediately by the lack of space that most people order, eat, and move on. Prince St. Pizza prides themselves on only using the finest ingredients available for their pizzas. These ingredients include homemade mozzarella, imported tomatoes, 100% extra virgin olive oil, and homemade ricotta. Some people might find the slices to be slightly overpriced, but even the quote on the wall by Frankie says, “Remember, you get what you pay for.” I will gladly pay for quality any day of the week. If you are like me, then you might have difficulty reading the menu. Maybe it was the font. Instead of hurting my eyes attempting to read the cramped menu on the wall, I decided to just walk up to the front counter where all the pizzas were on display behind the counter. From here, I just pointed at what I wanted: a Spicy Spring Slice. All orders were made and picked up at the front counter. If you are in a rush, you can also do your order to go. After making my order, my slice was placed inside the brick-lined Marsal & Sons gas-fired oven until the crust was crispy, the cheese was bubbling hot, and the pepperoni was curled. The Spicy Spring Slice ($3.95), ordered extra crispy, is the signature dish of Prince St. Pizza. It may look simple with only sauce, mozzarella, and pepperoni slices, but this square was culinary perfection. At first glance, I thought the thick square would be heavy, but the moment I picked it up, I knew it was anything but. The bottom crust was crispy, giving each bite a delicious charred flavor. The inside dough was light and puffy. The crispy bottom and fluffy center gave this slice a perfect balance of texture. On top of the crispy and doughy crust was a layer of fresh and gooey homemade mozzarella cheese. The cheese, which you could taste in every bite, melted wonderfully into the crispy crust, curled pepperoni, and tangy tomato sauce. The tomato sauce, which I was told was known as a Fra diavolo sauce, was made with sweet tomatoes, roasted garlic, and red peppers. The sauce, which had a slight hint of acid from the tomatoes, was a perfect blend of sweet and slightly spicy. The star of the dish without a doubt was the miniature slices of natural casing pepperoni. When baked, the pepperoni slices curled up into small cups which were perfectly crispy, salty, and greasy with delicious and rich pork fat. This slice had it all from texture to flavors. A crispy crust, light doughy inside, tangy, sweet, and spicy tomato sauce, fresh mozzarella, and crispy and crunchy pepperoni. It’s tough to follow up such a delicious slice as the Spicy Spring Splice, but next up was the Original Prince Neapolitan Slice ($2.95). This slice of Margherita pizza was simple: cheese, marinara sauce, and a few slices of fresh basil. It may be simple, but the quality of each and every ingredient was top notch. Even though the crust was thin, somehow the slice still managed to have a great chewiness to the dough. The bottom crust had a crunchy bite that was perfect. No one likes eating a soggy pizza. The red sauce was fresh, tangy, and slightly garlicky which complemented the generous amount of cheesy, melted mozzarella that was cooked in the oven until it was golden brown on top. The Original Prince Neapolitan Slice may not be the signature dish here, but for the price, and for the fresh high-quality ingredients, I wouldn’t hesitate to order it again. Simple, but done right. Service was fast and to the point. Some guests might view this as rude, but for me, the service was anything but rude. I thought the service was efficient and even friendly. Be prepared to walk in, order what you want, eat at the counter seating, and move on. Prince St. Pizza is perfect for a quick lunch, evident by the endless number of construction workers streaming in and out of the place. 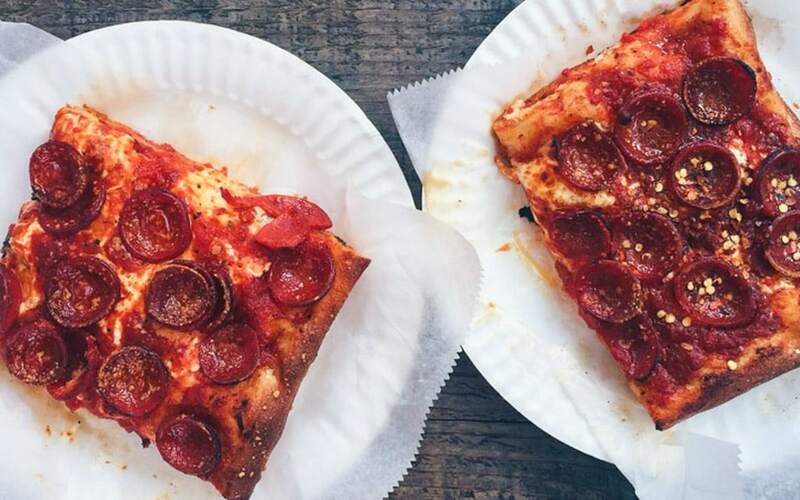 I am by no means an expert in New York Pizza, but personally, I found Prince St. Pizza to serve up one of the best slices of pizza in New York City that I have ever had. The margarita pizza was great, but the reason you want to come here is for the Spicy Spring Slice “Soho square.” It was crispy on the outside, soft on the inside. The sauce was sweet, spicy, and tangy. The cheese was bubbly and fresh. The pepperoni was crispy, greasy, and out of this world. Next time, make that every time I return to New York City, I will stop by Prince St. Pizza for a delicious Spicy Spring Slice.